There is no need for specialist liquid cleaners to leave windows with a sparkling finish. 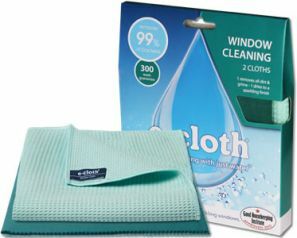 From windows to their frames and sills, both inside and out, your windows will never have been cleaner or clearer, than with the Window Pack and just water. One cloth removes dirt and grime. One cloth polishes shiny surfaces. E-Cloths work via 480,000 fibres per cm squared. By combinin unique technology with water they break up and hold grease, dirt and bacteria which normal cloths leave behind.